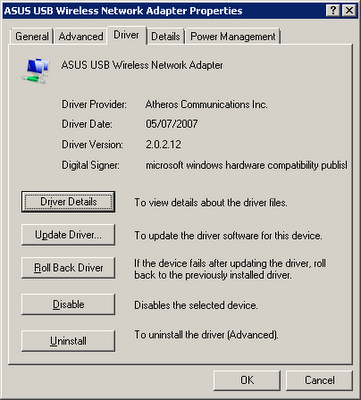 As some of you R2H owners noticed, there is a new R2H wireless driver on Windows Update - version 2.0.2.12, 05/07/2007 where the previous one I had was 2.0.2.2. It's too early to tell any difference, it just works and hopefully it fixes some issues, as it came out through the Windows driver treadmill. 30 August 2008: This driver seems to add the device in the Safely Remove Hardwar area, which makes sense for external USB devices but less for embedded ones. I don't know whether this is controllered by a setting in the .inf file or a property compiled in the device driver.